There are some universal scents we tend to associate with summertime – coconut, watermelon, and lemonade to name a few. One of the most frequent favourites out there is juicy strawberry, particularly here in Canada since we can only get local strawberries (as you should be buying) during the summery months. I thought it’d be fun today to theme my post around strawberries, with a few ripe for the picking ideas for seasonal gift-giving. Indulge! 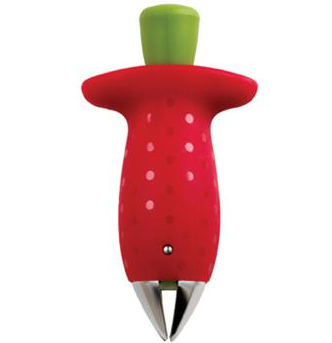 Tear out strawberry hulls in a snap with this adorable, kid-friendly kitchen gadget. Simply clamp & twist (as shown here) and in seconds you’ve got a perfectly hulled berry to bite into, slice, throw into a pitcher of lemonade, or fill with whipped cream or chocolate mousse. Makes a lovely hostess gift for your neighbour that invites you to a BBQ or play date. A friend of mine that knows a thing or two about make-up sagely advised me that bright, cheery colours are the way to go when blushing your cheeks. Although it’s tempting to reach for muted neutrals, they can actually dull your skin. Aim for saturated shade that works with your skin tone, like this rich, clay-based blush that works overtime for up to twelve hours, and helps minimize oily skin (like say, that slathered in sunscreen). Given the theme of the post, naturally I gravitated toward this shade – hook your favourite friend up for a special birthday treat. It’s hard to pick one delightful adornment from Etsy shop Scrumptious Doodle, which specializes in dessert-themed gems. But I’m digging this too cute set of rings that give quite literal meaning to the expression, ‘We go together like peanut butter & jelly.’ Share the set with a best friend that’s college-bound this fall, or gift the pair to that quirky friend of yours as a fun surprise. Make brunch a real treat with a drizzle of this sweet & sticky fruit syrup (also available in a half-dozen other berry variations). Throw it onto waffles or crepes with a dollop of whipped cream, or mix some up with your favourite ice cream sundae. In fact, bring some handmade waffle cones, vanilla gelato, and a bottle of this stuff to the next kiddie or adult party alike and you’ll instantly be a hero. Start your mornings off with a virtual visit to the farmers’ market with any item from the new Fruits & Passion Northern Strawberry collection. With Vitamin C-laden berries grown using sustainable practices right here in Canada, your skin will be drenched in moisturizing safflower and sunflower oils while your nose will be tingling with the unique blend of fresh berries, sparkling grapefruit, and garden-grown rhubarb alongside strawberry flowers and pink tulips. Put together a little gift basket as a sweet houseguest gift whilst you travel this summer. 1) Leave a comment below by June 23rd and tell me which sweet strawberry idea is ripe for the picking for your next gift-giving occasion. 2) Entries are limited to one per person / per email address / per household (or more if you score bonus entries). A random draw will be conducted on or around June 24th to select the winner, who will have 48 hours to respond before another winner is chosen in their place. 4) Bonus Entry: Like Fruits & Passion on Facebook and give me a shoutout in the comments when you’ve done so (along with your Facebook username) so I can credit you! I love the strawberry syrup! I commented on Fruits & passion facebook page and I liked them as well!! Love the strawberry jam and peanut butter rings! I would love to have the Northern Strawberry Collection. Mmmm.. the clay based blush! I’d have to buy two so I could part with one for my bf’s gift. Mmmm…. the strawberry syrup looks delicious! I would love the Northern Strawberry Collection from Fruits and Passion! The Strawberry Jam & Peanut Butter Rings would make a perfect gift for my younger sister who’s birthday is coming up this week! Oh, wouldn’t the Northern Strawberry Hand Butter feel good after a day in the garden!!!! I’d choose the PEI Preserve Strawberry Fruit Syrup. Cheers! I would love the Tarte Amazonian Clay blush. Love the strawberry jam and peanut butter rings! Too cute! The rings are so cute and the strawberry fruit syrup would be nice to try too. would love to try this, love the scent of strawberry! I’d love to try the Tarte Amazonian Clay blush. Works for 12 hours? Gotta try. I love strawberries and they all look fantastic but I thought the strawberry huller would be perfect for my mom who makes the best jam. The strawberry syrup sounds yummy. The Strawberry Fruit Syrup sounds so good! I have my own strawberry field, so would love the strawberry huller. I left a comment on the Fruits&Passion facebook page under Janice E Cournoyer. Strawberry Fruit Syrup sounds like a great gift for an upcoming house party. I like the Chef’n Stemgem Strawberry Huller. Not only would I like one myself, but I know a few people it would make a great gift for. I like the Strawberry Huller. It is a unique gift, which I like. I know I hate hulling them with a knife so this little beauty is a really cool idea! I’d like to try the Northern Strawberry Collection. The Northern Strawberry Collection and I liked their Facebook page! I think this probably smells devine and I love body products! I like the strawberry blush. I would love to give the Strawberry Syrup. Northern Strawberry Collecton 🙂 Yummy! I love the strawberry syrup. The Fruits and Passion collection! Delicious..the Northern strawberry collection…would love to give but also would love them for myself! definitely the peanut butter and jelly rings! how cute are those?! I would purchase the Strawberry Collection from Fruits & Passion. I have liked Fruits & Passion on Facebook and commented on their page. The strawberry fruit syrup. Of course, it would never make it out of my hands to give away. I can already taste it on my next batch of pancakes or french toast. yummy. I already like fruits&passion on facebook, and i commented on their wall. same name as on this entry. Definitely the Tarte blush, although the Fruits & Passion items come in a very very very very very close second! I think the strawberry syrup would be my choice. I bet it would be delicious in some iced coffee. the tarte muted strawberry blush is beautiful ! We were in PEI a few years ago and we went to the island preserve company and everything we purchased was amazing.I’d choose the syrup to give!!!! I would love to try the strawberry syrup!! 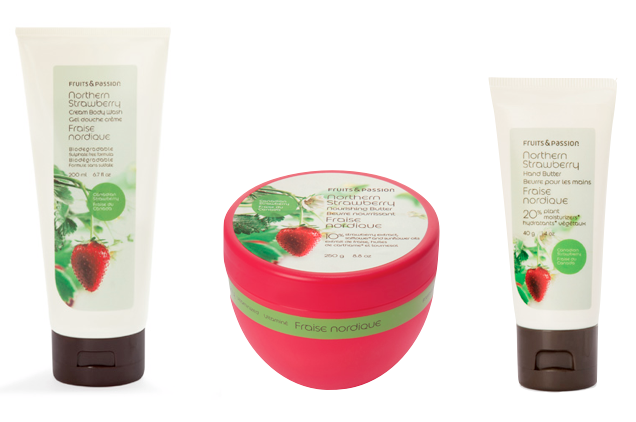 The Northern Strawberry Collection by Fruits and Passion is exactly what I need for my next gift to give! Hi, liked on FB and mentioned you. User name Aim Sprague. I love those rings, I would give them to my two cousins, or to my sister and me! the strawberry syrup look good! I posted on the Fruits and Passion Facebook page. I think the Sephora blush would make a nice gift. Mmm strawberries, the scent of summer! I like the tarte Amazonian clay blush! would love to receive the strawberry syrup myself, lol, it’s probably delicious, and it would make an excellent hostess gift. That strawberry huller is awesome. I know lots of people in my family who love strawberries, this would be very useful. the strawberry syrup for me. We went to PEI Preserve company 2 years ago, fabulous store. left a comment on the Fruits and Passion Facebook page. Also liked their page. I think the Strawberry Fruit Syrup would be a great gift for Mom! Love the strawberry jam and peanut butter rings, so cute! The strawberry jam and peanut butter rings would be such cute gifts for my twin daughters’ upcoming birthday! I love the TARTE blush, I have tarte bronzer and it is great! The Northern Strawberry collection is the one I’d be giving! I love that strawberry huller! It’s so much cuter than the old school gadget that I remember using in my grandmother’s kitchen! I think the strawberry huller is so cute! And I like the tarte blush! 🙂 Left a comment on fruits and passion’s fb page and also liked them. Chef’N StemGem Strawberry Huller, would be a huge time saver for my mom. Great idea! The strawberry Huller of course! the pb and jelly rings! Fruits & Passion Northern Strawberry collection is my favourite! Love the peanut and jelly rings! The rings are great!!! Peanut butter jelly time! I love the Fruits & Passion strawberry products………….the hand lotion would be especially nice. I’d love to bring the Strawberry Fruit Syrup up to the cottage for delicious pancake breakfast on the deck. I think my family would love the Strawberry Fruit Syrup. My oldest son loves to make us breakfast on the weekends and this would be a great addition for him to experiment with. I can hardly wait! I Like Fruits & Passion on Facebook as Diana Z.
the rings are tooo cute! 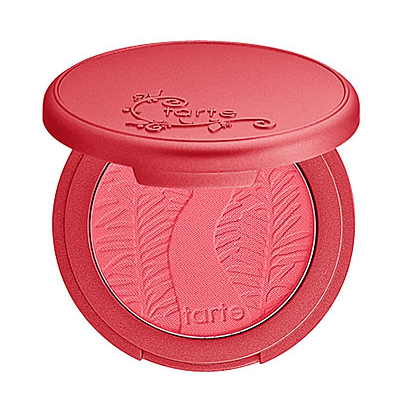 I like the Tarte Amazonian Clay 12-Hour Blush in Muted Strawberry Red gift idea. Definitely those yummy strawberry jam and peanut butter rings. I think those would make a wonderful “bling” favorite for my daughter’s upcoming birthday party! Strawberry syrup sounds yummy for our Sunday morning waffles. Add a little whipped cream and it is a gourmet breakfast. I LIKE THE NORTHERN STRAWBERRY BODY WASH,NOURISHING BUTTER,AND HAND BUTTER.WON’T I BE SWEET SMELLING? I ”LIKED ”THE SITE TOO! I’d love to give the strawberry huller with the preserves. 🙂 So cute! Thanks for the chance! I’d love the Fruits & Passion set! Thanks! Definitely the Tarte Amazonian Clay blush! I would love the gift of the strawberry syrup for French toast, which my daughter would love (and me!) and I would also love the Fruits and Passion Strawberry gift set – I already “Like” them on Facebook, (English) page and you can find me under my username: Dawn Cruickshank Baldwin. I commented a few moments ago, on their Wall. Thank you and I hope that I’m a lucky winner. 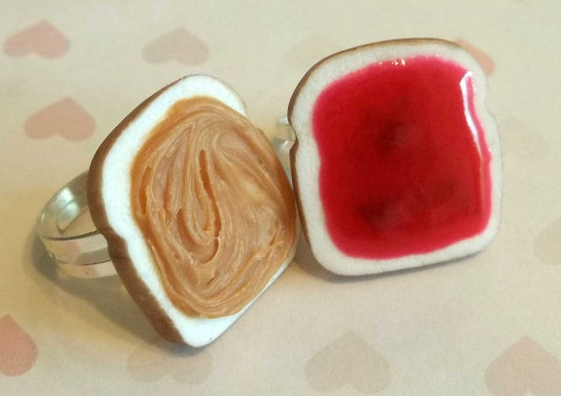 I love the PB & J rings! Stramberry gam and peanut butter ring are so cute.I had to have it. Definitely the Tarte Clay Blush!